More and more Pakistanis are sharing in their nation's development, according to World Economic Forum (WEF). Pakistan ranks 47 among 74 emerging economies ranked for inclusive development by WEF released recently at Davos, Switzerland. 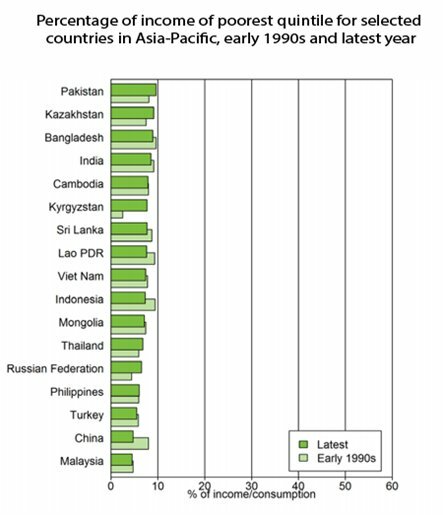 Inclusive development in the South Asian country has increased 7.56% over the last 5 years. World Economic Forum assesses inclusive development based on "living standards, environmental sustainability and protection of future generations from further indebtedness." 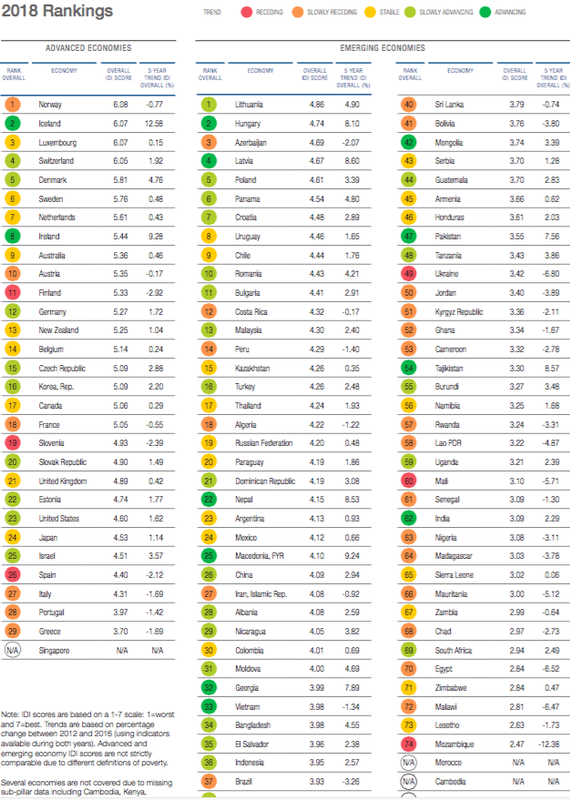 The WEF inclusive development index ranks Pakistan at 47, below Bangladesh at 34 but above India at 62. The 7.56% rate of increase in inclusive development in Pakistan is higher than 4.55% in Bangladesh and 2.29% in India. China ranks 26 and its inclusion is rising at a rate 2.94%. Pakistan has improved its ranking from 52 last year to 47 this year, while India's rank worsened to 62 this year from 60 last year. China's ranking also worsened from 15 last year to 26 this year. Another WEF report compiled by Oxfam said the richest 1% of Indians took 73% of the wealth generated last year. Although more people in China have lifted themselves out of poverty than any other country in the world, the poorest quintile in that country now accounts for a lower percentage of total income (4.7 per cent) than in the early 1990s (8.0 per cent). The same unfortunate trend is observed for a number of other countries, including in Indonesia (from 9.4 per cent to 7.6) and in the Lao People’s Democratic Republic (from 9.3 per cent to 7.6). In addition to building a major seaport that will eventually handle 300-400 million tons of cargo in a year, China has built a school, sent doctors and pledged about $500 million in grants for an airport, hospital, college and badly-needed water supply infrastructure for Gwadar, according to Reuters. 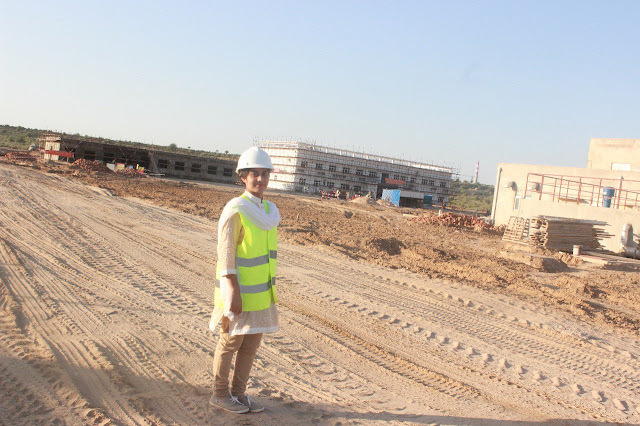 The Chinese grants include $230 million for a new international airport in Gwadar, one of the largest such disbursements China has made abroad, according to researchers and Pakistani officials. New development work in Gwadar is expected to create as many as 20,000 jobs for the local population. Thar, one of the least developed regions of Pakistan, is seeing unprecedented development activity in energy and infrastructure projects. New roads, airports and buildings are being built along with coal mines and power plants as part of China-Pakistan Economic Corridor (CPEC). There are construction workers and machinery visible everywhere in the desert. 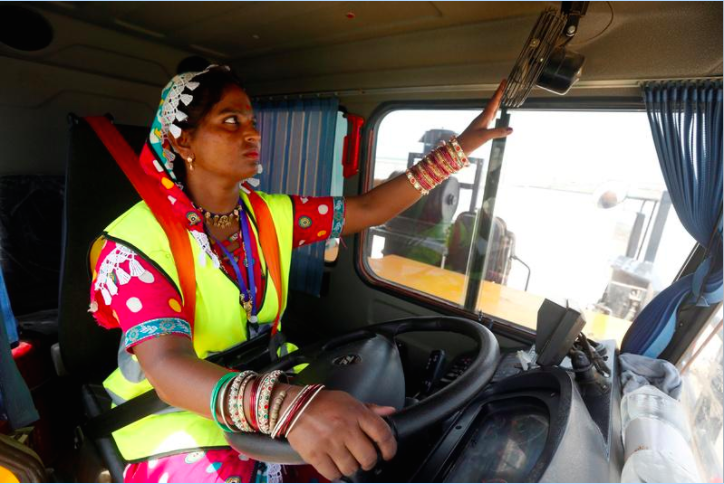 Among the key beneficiaries of this boom are Thari Hindu women who are being employed by Sindh Engro Coal Mining Company (SECMC) as part of the plan to employ locals. Highlighted in recent news reports are two Hindu women in particular: Kiran Sadhwani, an engineer and Gulaban, a truck driver. The region has a population of 1.6 million. Most of the residents are cattle herders. Majority of them are Hindus. The area is home to 7 million cows, goats, sheep and camel. It provides more than half of the milk, meat and leather requirement of the province. Many residents live in poverty. They are vulnerable to recurring droughts. About a quarter of them live where the coal mines are being developed, according to a report in The Wire. Some of them are now being employed in development projects. A recent report talked of an underground coal gasification pilot project near the town of Islamkot where "workers sourced from local communities rested their heads after long-hour shifts". More and more Pakistanis are sharing the fruits of development in Pakistan as shown by the World Economic Forum report on inclusive growth. WEF ranks Pakistan at 47, below Bangladesh at 34 but above India at 62. The 7.56% rate of increase in inclusive development in Pakistan is higher than 4.55% in Bangladesh and 2.29% in India. The share of national income of Pakistan's poorest 20% of households has increased from 8.1% to 9.6% since 1990 , according to the United Nations Economic and Social Commission for Asia and Pacific (NESCAP) Statistical Yearbook for 2015. It's the highest share of income for the bottom income quintile in the region. Development of China Pakistan Economic Corridor (CPEC) is transforming Pakistan. 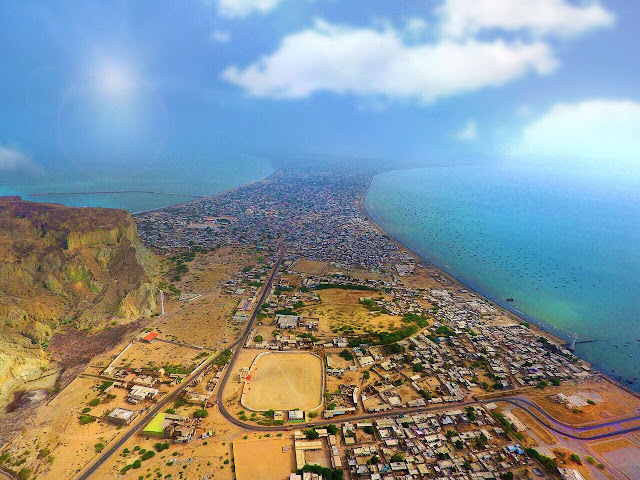 Among the parts of the country being transformed the most by CPEC are some of the least developed regions in Balochistan and Sindh, specifically Gwadar and Thar Desert. True, true. A long way to go for us Pakistanis. Pakistan’s new government is understandably preoccupied with short-term economic problems, but it must also lay the foundations for a more inclusive long-term growth model. If it succeeds, the Pakistani economy might finally start to meet the rising aspirations of the country's young population. A third priority is to ensure that growth is inclusive, just, and sustainable. The “Economy of Tomorrow” project, conducted by the Pakistan-based Sustainable Development Policy Institute – where I work – and the Friedrich-Ebert-Stiftung, has highlighted several key requirements in this regard. Fourth, the state must create room for entrepreneurship. With over 60% of Pakistan’s population under the age of 25, the public sector clearly cannot absorb all new entrants to the labor force. The solution may instead lie with startups and small and medium-size enterprises. An earlier report by the British Council Pakistan, for example, indicated a surge in startups in diverse sectors. The number of young Pakistani entrepreneurs is rising significantly, and not only because of the country’s youthful population. Rural-to-urban migration, new public-sector universities, incubators, and accelerator initiatives have also helped. Government policy should now aim to reduce the failure rate of startups and help them to grow. It must also ensure that startups are an option for young people – including women – from all regions and economic backgrounds, including by removing barriers to market information and credit.